From Internet Archive: “Harsh tale of an alienated criminal’s attempt to impersonate his psychiatrist-double. 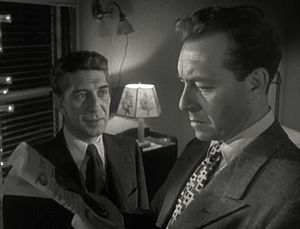 Important fatalistic noir, with classy visuals and a very fine script that features a creative doppelganger theme.” – noir expert Spencer Selby. This entry was posted in Culture, Film Noir, Movies & TV, Video and tagged Film noir, Movies. Bookmark the permalink.